Wow! It has been way too long since I've blogged but I'm going to make a concerted effort to begin again and blog frequently. Since I last wrote I have fallen in love with the art of Crazy Quilting. I love the hunt for trims, threads, ribbons, etc. and the beautiful results that can be achieved with a minimal amount of practice. Of course, the more you do, the better you get... so that's the hook. Always looking for new ways to use the many items that you've hunted down. And then there's fabric.... The funny thing about Crazy Quilting is that the fabric is secondary, just a means to an end. As opposed to "sane" quilting, which I also love, where the fabric is the main event. And best of all, there's the fellowship. We have a small group of crazy stitchers that meet once a month. We almost always have a Round Robin project in progress. A Round Robin is essentially a group project. There are many ways to do a Round Robin but recently we settled on the following method. If you want to participate you must piece together one block for each participant. Then you embellish a "seed" block that sets the tone (colors, style, scale, etc.) for the rest of your blocks. Each month you embellish someone else's block and bring it to the meeting. This continues until all of the blocks have been embellished. The finished blocks are returned to their owner who turns the blocks into a finished product, usually a wall hanging off some sort. It's tons of fun and encourages you to do your best stitching. At our monthly meeting we always have time to share the projects we're working on, besides the Round Robin. Apparently we are very lucky to have such a group, we've heard that Crazy Quilting groups are few and far between. I cherish these friendships and have learned so much from them. Recently I was invited to the wedding of the daughter of our long-time friends, Bruce and Leslie Norton. The bride's a very feminine girl, a tall and lithe dancer whom I immediately thought would enjoy a small, crazy quilted purse. BUT I had never made one before, is that a problem? Not in my book. It did require a fair share of un-stitching and stitch lifting (copying another's stitches) and a large share of anxiety but it turned out lovely and now I want to make more. 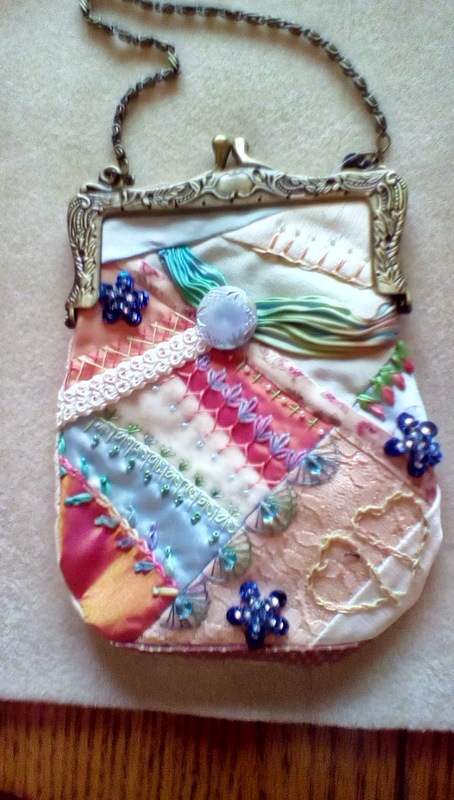 I'm so glad that I challenged myself to make that little purse, a feat I later learned that even my more accomplished crazy quilting friends had not undertaken. We are heading home tomorrow and I just can't believe how quickly this month in Florida has gone by! I’m not sure if it has been the wonderful weather, the two and three hour walks on the beach, being able to Skype my sweet little granddaughter or, say it ain't so.... maybe I am getting older and time is just passing by faster. Noooooooooooo! Regardless of the reasons, we'll be leaving soon and I have such mixed emotions. I love the peace and quiet here and I am able to do things I never find time for at home. Out here I can do jigsaw puzzles, read all day long, peruse all of the wonderful blogs that I find on the internet and I even re-organized my files on my laptop - something that I had been meaning to do for over a year!! PLUS the phone rarely rings – yahoo! Since we are renters and the Cape gets terrible cell phone reception, we rarely get a phone call, land line or cell phone. It is marvelous! BUT I do miss my home... my bed, my sewing room, my kitchen supplies (there isn't one spatula here! ), all of my stitching buddies and my girls (my daughter and granddaughter). So I guess it is a toss-up! I am just so grateful that I get to have this time away from the COLD, SNOW and GLOOM of a Kansas City February. This year, in particular, I am super appreciative since my friends and family have had to put up with TONS of snow since we left Kansas City. I think in total I have heard of about 12” – 16” of snow – unbelievable and unheard of in the last decade! It proves the old adage that there is no place like home. The time away always makes me appreciate how much I love my home and the many wonderful things that go with it. Before I left Kansas City I decided to keep track of all of the things that I make this year. In the past, when I look back on the year it feels like I didn't do much at all. Then I wonder, what the heck did I do with my time this past year. Well, I have a pretty good idea that I am not accounting for lots and lots of projects that were done so I thought it would be interesting to see what I actually do get done in a years time. I am keeping track in a notebook and I will post pictures and processes on here so that it will be documented. It will be fun to post the first few things that I made this year and just didn't get a chance to post!! Well, I'd better rest up because there will be so much to do when we return, but it is all worth it. I can’t wait to get back to my studio and get cranking on the many wonderful ideas I have read about on the blogs I have been reading. Many years ago I met a very sweet and funny gal at quilt guild. We quickly became quilting acquaintances and every month we would get caught up on what was happening in our lives. And then she started Machine Quilting like a demon and rubbing elbows with some pretty big names in the quilting world and now I never see her - at least in person. This woman is Angela Walters and I am pleased to say that I knew her back when she hadn't even bought her first Longarm quilting machine. The other day I saw her - on the side of a semi truck!! Every time I turn around now I see that she is teaching a class at a national quilt show or teaching a new class on the Craftsy website or she is designing a new quilting pattern - this gal is always in the quilting news lately. This week she is lecturing at the Quilt Con event in Houston, TX - the newest big quilting event and it's for Modern Quilters. 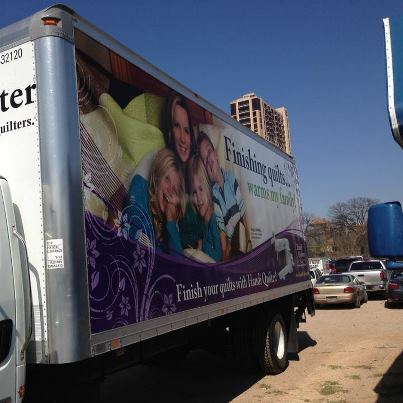 Of course, she's involved since she is a premier machine quilter for modern quilt makers (and traditional ones, too)! Angela posts frequently on Facebook and it is so much fun to see what she's been doing and what famous person she has befriended this week! Also, she has a terrific blog that covers a lot of ground. My favorite takeaway is her discussions about why and how she has quilted a top in a particular manner. Since I do my own machine quilting, on my domestic sewing machine NOT a Longarm, I love the abundance of information that is available on Angela's blog. What amazes me is how humble and sweet Angela has remained in spite of her new found fame. Her blog is NOT a brag-fest, telling us all about how she has done this great thing and that great thing. Rather, she shares what she has learned by trial and error so that we, as readers, will be able to make better quilting decisions and thus, be better quilters. This is so typical of Angela and what makes her universally appealing to so many people. Her blog is http://quiltingismytherapy.com/ - take a minute and check her out and look her up on Facebook. 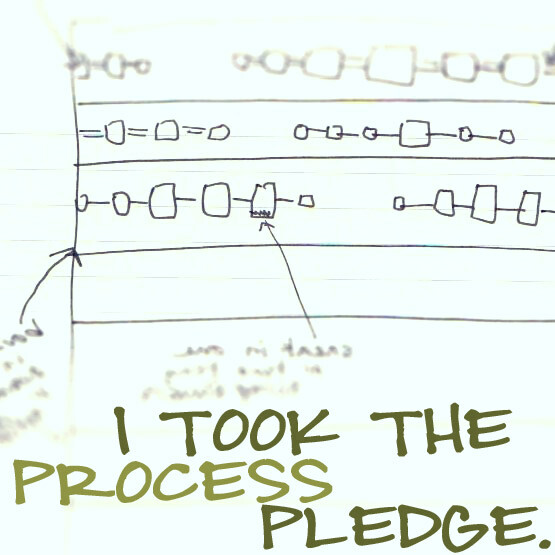 I just added a badge to my blog that says "I took the Process Pledge". It is the brain-child of Rossie's blog http://r0ssie.blogspot.com Basically the pledge states that as a blogger I will post more about the processes involved rather than posting a finished product. I totally understand this concept because I love to look at other artist's journals or idea books that contain the sketches and notes that contributed to the design choices that were made along the way. So by taking the Process Pledge I will be posting more about the beginnings of a project and also the various steps along the way with copies of my sketches or photos or books I read that inspired me to take a certain direction in my project. I think it is a wonderful idea and hope to be able to hold up my end of the bargain! Last Friday was one of those perfect Fall days so we decided to take advantage of the gorgeous weather. My daughter, grand-daughter and I went out to the Deanna Rose Farmstead and roamed around for several hours, just enjoying the company of each other.There is so much to see and do there, most of which revolves around life on a farm so there are lots of animals, tractors and hay. It is days like this that make me so happy that I have a grandchild so I can go and do things like this without looking foolish. As you can see by the pictures below, a good time was had by all!! Saturday I went on a bus trip to Des Moines, IA for the AQS Quilt Show/Des Moines Area Quilt Show. What a fabulous show - we go every year and I never get to see it all because there are so many quilts and vendors. The quilts are so fabulous that I have to examine each one with my nose almost touching the quilt to see if it is done by hand or machine or to see if it is pieced or painted or to see a particular technique up close to figure out how it was done. That is why it takes me so long - well, and also I have to visit each vendor to see what wares they can tempt me with (which isn't always very difficult, unfortunately). The first quilts we looked at were done by 50 up and coming Japanese quilt artists and boy, were they something else! I definitely had my nose close to several of those. Not all of them were done using the typical taupe and beige hues, these flamboyant new quilters are using more of the red/orange/yellow hues. But, as one would expect from the Japanese quilters, the technical aspects were perfection and the math that had to be employed was astounding. I like to get up close to the quilts to see what machine quilting patterns they are using and I wasn't disappointed this time as I found two new patterns that I believe I can use often. One looks like the Cathedral Windows quilt block and the other is a daisy chain. I just need to sit down at my sewing machine to figure out how to quilt them with the best flow from one motif to the other. The daisy chain is relatively easy, I think, and I believe I know how I will do the Cathedral Windows but both will take practice to get them perfected to the point where I am comfortable using them on a quilt. A lot of the vendors were selling wool patterns and products so I just had to purchase several little wool projects, well, more than several. Put it this way, I can't leave this earth for many, many years because I now have at least a 50 year back log of projects that I want to make. I also bought an adorable red work pattern of a small child rising in the morning to put at the head of my granddaughter's bed. I found some hand-dyed floss that is a reddish/pink (red just wouldn't go well in a room with pinks and purples) that will be perfect for this project! I know you are supposed to use RED floss in RED work but I have a very hard time following the rules!The pattern is already traced onto unbleached muslin and ready to start. Aren't Quilt Shows great? It doesn't get much better than 40 quilters, many of whom are my closest friends, piling on a bus and heading to a place that is filled with beautiful quilts and friendly vendors. Wandering around for hours until your feet won't let you go any more and then getting back on the bus with your head filled with ideas and inspiration. The night after I have been to a quilt show is always a restless one because I am creating so many quilts in my mind that it just won't let me rest. It's great. Since we are going to be doing some extensive traveling in the near future, I have been stockpiling hand work projects to take along to keep me busy in the car. It is the only way that I can sit in the car for 8 - 10 hours at a time. Well, off to put a very small dent in my quilting projects. Thanks for tuning in for today!! My girls on the hay ride - aren't they lovely?? Yum! Chocolate Ice Cream. We are all crazy for ice cream! Another post for a long completed FMQ entry. I did the March challenge in May but since I am the world's worst procrastinator I did not get it posted until now - bad, I know. Since I have been planning on doing all of the tutorials at some time before the end of the year, it really doesn't matter what order I do them in OR what order I post them in! The March FMQ tutorial is by Ann Fahl and, boy, it was loaded with information! Ann shares my passion for quilting with variegated threads - I just love them! My favorite way to use them is in combination with some rich, luxurious solids- you just can't beat that combination. She preferred Superior Rainbow and YLI, I haven't used YLI but will give it a try now! I will be reading Ann's book Coloring With Thread in the near future so that I can learn more from a fellow thread-aholic. Ann uses a titanium coated topstitch needle from Superior Threads - use the appropriate size needle for the thread that is being used. I have been using a universal needle but I am learning that there are better needles to use (Paula Reid uses a denim needle for its sharp point). I found the section on 'Order of stitching/quilting to be invaluable - it is quite similar to the method that Sandi McMillian presented at my quilt guild in May and her quilts were spectacular with large motifs quilted on her domestic machine. It is too lengthy to include here so I have copied this section and put it into my Machine Quilting notebook for future reference. If you are interested in it, add a comment here with your email address and I will email the information to you. To move the fabric under the quilting needle, Ann also uses a version "Stuff & Fluff" or whatever you wish to call it. The quilt rests on her chest ready to be pushed under the needle. She then fluffs the quilt off her chest and pushes the free or loose edges toward the needle - thus only moving the immediate area rather than the entire quilt. Also, she pays particular attention to all four corners - always knowing where they are will prevent you from inadvertently folding a section under and quilting it, too. Seems to be a common theme amongst most of the machine quilters who use their domestic machines to quilt larger quilts. It is so heartening to learn that there are so many large quilts being quilted with domestic machines because after all, not all of us have the space and/or money to make use of a long-arm quilting machine. These tutorials at SewCalGal have been invaluable to me for solid and tried & true techniques that have been used over and over again. After some absence, I really am hoping that I will post more regularly. I think about what to post here often but the leap from my head to my blog just doesn't happen! I am participating in the Free Motion Quilting Challenge at Sew Cal Gal's blog. Each month there is a video by the featured quilter with machine quilting tips and techniques as well as sharing some great machine quilting patterns for us to use. This has been in place since January 2012 and I have learned so much! Haven't always submitted my "homework" on time but it is the learning experience that counts.This is one of those rare months when I have completed my homework and submitted it in time to be eligible for the monthly prize package - yippee! September's featured quilter is Paula Reid and she has shared her "Fluff & Stuff" technique for quilting large quilts on a domestic sewing machine. This woman has quilted more than 1400 quilts on her domestic sewing machine NOT a long-arm quilting machine - amazing - and she said that 3/4 of them were queen or king sized. So good to know that it is possible to quilt the larger quilts without using a long-arm!! Basically, Fluff & Stuff is what I have been doing myself, although I might not be as deliberate in my "fluffing" but I will be working on that. Paula is suggesting that you fluff the quilt up on to your chest and then stuff the quilt through to get quilted. The fluffing is what helps to keep the quilt from getting hung up while feeding through the needle and keeps things moving smoothly. In addition to the video Paula had several great tips that I will definitely be trying like working in 90 minute increments and then making yourself stop and do something else for awhile - anything to help maintain good stamina and focus is good for me! She also suggests using a straight-stitch throat plate - I haven't tried it yet but her reasoning really made sense to me and since I have such a throat plate I will be trying it out. Also she uses a jeans needle instead of a universal needle because the jeans needle is sharper which allows for straighter quilting lines. The one suggestion she has which I won't (or can't) do is to put your sewing table in a corner so that the back and one side of the table are against a wall thus keeping larger quilts up on top of the table so you aren't fighting them all the time. I can't do this because no matter how I configure my sewing room I just can't get my table in a corner and still be able to open doors or move about the room so I must pass on this suggestion, although it sounds like an excellent idea! Finally, Paula shared a quilting pattern with us and I quilted it up using the transfer technique that Don Linn taught us earlier this year. I don't know how often (if ever) I will use this pattern. It was not specifically for continuous quilting and so there are a lot of lines that must be re-traced which made it very difficult to quilt. 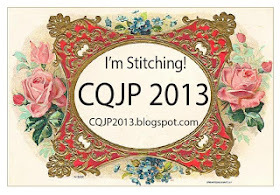 Take A Look at my CQJP 2013 Blocks!! Hello! I am Mary Rohrbeck and I love to CREATE – hence, the name of my blog. I have many, many creative interests and am passionate about each one. I am retired and doing all the things that I want to do couldn’t be happier! Being retired allows my husband and I to travel to two special places each year --our summer cottage in the Finger Lakes region of New York State and Cape San Blas in the Florida panhandle. When we go there we are gone for weeks at a time. Yes, quite a challenge for someone who has a studio full of supplies! But I make it work by doing small projects while I am away. I live in a quaint, small town in Missouri called Parkville. It is right on the Missouri river tucked into the river bluffs. I spend lots of time in my studio and I also love to garden, read and meet up with my girlfriends. Three of my favorite girlfriends are my daughter, Meghan, and my two granddaughters, Kayla and Jenna. I love doing things with those girls and we have quite a time together!